It's the law! Maryland is frack-free. Governor Hogan signed HB1325 today. 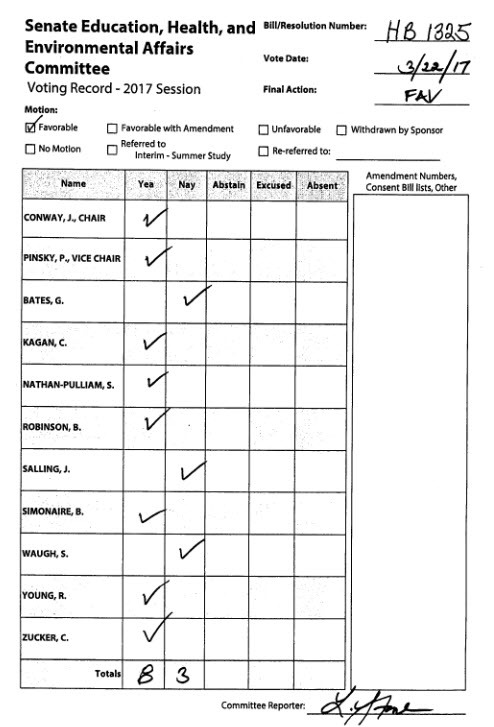 In contrast to Senator Edwards' last ditch attempt with another moratorium amendment (he asked for 10 years), the Maryland Senate voted tonight, 35 to 10, to ban fracking in Maryland. Thanks go to the senators, the delegates, and the governor who recognized the wisdom of banning fracking in Maryland so that we will have clean water and air in our state. But special thanks go to all of the many organizations and individuals who were involved in this campaign. On Wednesday, March 22, the Education, Health, and Environmental Affairs Committee voted 8-3 to allow the bill to proceed to the senate floor. On Thursday, Senator J.B. Jennings requested a delay on a vote. According to him, the senate "needed a breather" because they had many other important bills to consider on Thursday. He later said in a video taken in his office that he would not be adding any amendments and expected that a vote would be held early next week and the bill would be ready for the governor's signature by Wednesday. In the meantime, thank the senators who voted for the bill to proceed. If your senator was one who did not, then please call your senator and ask for the senator's support on HB1325 to ban fracking in Maryland. So what can you do now after Governor Hogan’s announcement? Make 2 phone calls. The senators still need to vote on SB740. Originally, 23 members of the 47 member senate body sponsored the bill. If your senator is not a sponsor, please contact and ask your senator to support a total ban on fracking and to vote for the bill. Use this link to determine your senator’s phone number. Besides calling your senator, please call Mike Miller, the senate president. Senator Miller's phone number is 888-997-5380. The calls will be painless. His staff person answering the call will ask for your name and address, and make a note of your position. Indicate that you want your representatives to consider what is right for future generations. Thank you demonstrating good stewardship! March 17, 2017 -- the best St. Patrick's Day Ever!!! The house bill to ban fracking, HB1325, passed in the House of Delegates on Friday, March 10, by an overwhelming majority – 97:40. View the vote tally. Thank your delegate if they voted for the ban! The equivalent bill on the senate, senate bill SB740, has not been allowed out of committee yet. 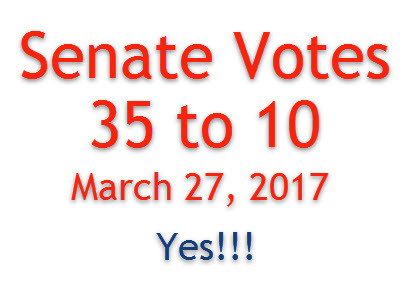 If allowed on the senate floor for a vote, 24 votes would be needed to pass since there are 47 votes total in the senate. There are already 23 cosponsors for the bill. At this juncture, it is critically important to either write or call your state senator and ask your senator to support bill SB740. The bill must go through the Education, Health, and Environmental Affairs Committee in order to be discussed and voted in the senate body. Unfortunately, Senator Carter Conway also muddied the waters by submitting a "competing" bill, SB862, which calls for a 2-year moratorium on fracking. The energy industry and lobbyists support this bill because at the end of two years the bill calls for county by county referanda to allow fracking. There are multiple reasons why this bill will not be a good law. Download this spreadsheet to see the complete list of senators and where they stand with the fracking bills. Click on this link to determine your district and your senator’s contact info. In his Op-Ed to the Baltimore Sun on January 12, 2017, Delegate Dan Morhaim from Baltimore County encapsulates many of the inadequacies of Maryland's proposed fracking regulations. Chesapeake Climate Action Network (CCAN) currently has an online petition for your state legislators to pass a permanent, statewide ban on fracking. Please consider signing this petition, but more importantly, also send a letter to your state reps. Refer to the template and a link for determining their address info. 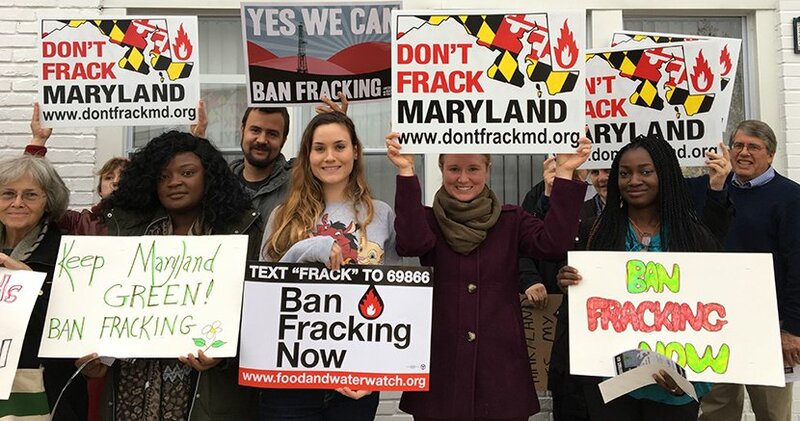 Hundreds of people across Maryland came out November 14-18 and demanded that our elected officials in Annapolis ban fracking during the upcoming legislative session. Find the latest news regarding fracking in Maryland. The fracking moratorium in Maryland will end on October 1, 2017. As of March 27, 2017, the Maryland House and Senate have both passed HB1325 which prohibits fracking in the state of Maryland, beginning October 1. Call or write your Maryland legislators. Thank them if they voted for the ban on fracking. If your reps did not vote for the ban, let them know that having clean air and water are continuing concerns of yours. You might mention that you appreciate the stand that both houses and the governor took -- they listened to their constituents' wishes and were not swayed by industry reps, lobbyists, or party influences. To readers not residing in Maryland, I hope that you will find the site helpful and possibly useful to stopping fracking where you live. Please Do Not Frack Maryland!